A stunning upcycled original Lloyd Loom Ottoman. 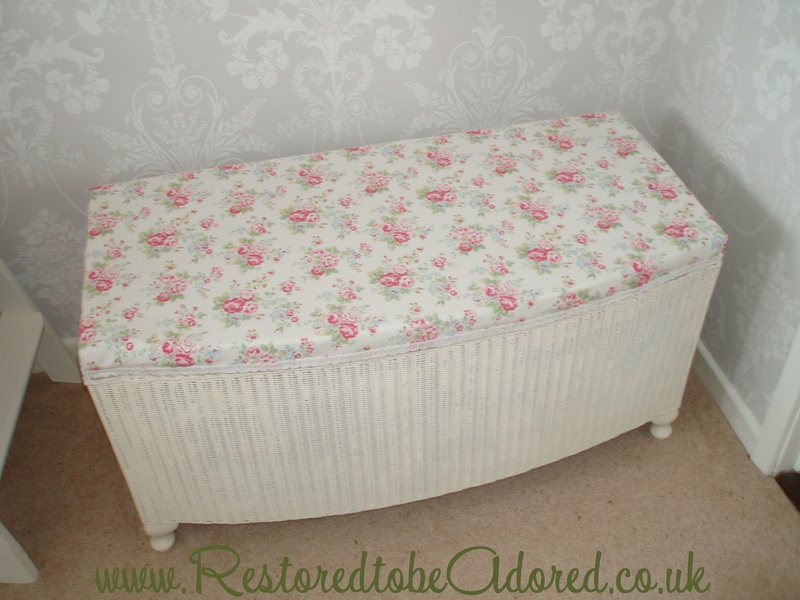 This pretty and practical piece has been painted in White pure and natural paint chalk paint and reupholstered with new sponge and beautiful Cath Kidston ~ Spray Flowers Cotton Duck. The fabric has been treated with Dunelm fabric protector http://www.dunelm-mill.com/shop/fabric-protector-spray-110937 . As this set has been hand painted there may well be signs of texture, so it is not for someone looking for a factory finish. This is a fantastic elegant piece, a definite show piece for any room in the house that also provide some useful storage space. As a preloved character set it has the associated knocks and dings that vintage and reclaimed furniture picks up from age and use. You can buy with confidence I have received 100% positive feedback. I use the eco-friendly ; pure and natural paints, waxes and sealants. These paints provide a fantastic lightly textured and matt finish which is perfect for the shabby chic look. You will be able to see light brush marks where it has been hand painted adding to the character of my pieces. Only good quality products, please visit my suppliers website for full details; www.dunelm-mill.com, www.CathKidston.com. Delivery can be arranged within 25 mile radius of Maidstone, Kent please contact me for a quote. Unfortunately I can’t provide a personal delivery service outside this radius. Hi, you have beautiful work. What is the price for this iteam? And how much to ship to Westland, Michigan? Also, do you do special orders, like if I wanted one a little smaller ext? Please let me know when u get chance? Hi, do you still have any of these Lord loom ottomans available ? This is exactly what I am looking for.